MOSCOW, February 2. /TASS/. Russia should not stand at a closed door and knock, seeking resolution to the disarmament issue and Moscow has nothing but wait when the United States is mature enough, Konstantin Kosachev, chair of the foreign affairs committee of the Russian Federation Council (upper house of parliament), told TASS on Saturday. According to the senator, should Washington deploy missiles of intermediate and shorter range near the Russian borders if the US withdraws from the Intermediate-Range Nuclear Forces Treaty (INF Treaty), Moscow will respond in kind, but the initiative will not come from the Russian capital. 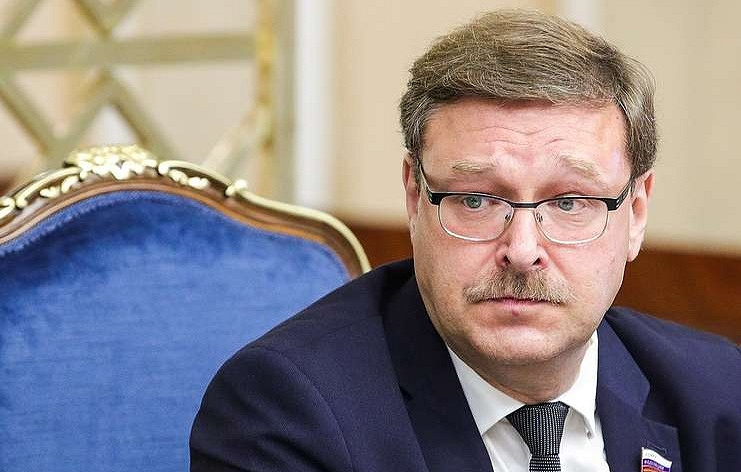 "Russia does not have any longer to stand and knock at a closed door, suggesting various disarmament options to the United States," Kosachev told TASS. "Now, we have to wait until Washington gets mature for dialogue. The fate of the treaty has depended and does depend on the US steps." "We will be closely following US practical steps after it suspends liabilities under the Intermediate-Range Nuclear Forces Treaty," he added. In case the US starts deploying its missiles of intermediate and shorter range near the Russian borders, Russia will be forced to deploy own missiles both in the country in the immediate vicinity of Russia’s geographical neighbors and on the territory of Russia’s allies. "But we will do this only in response to US action. Not as an initiative. Our steps will be a forced reaction to Washington’s actions," he assured. On Friday, US President Donald Trump and Secretary of State Michael Pompeo said that Washington would suspend its liabilities under the INF Treaty starting February 2 and would quit it within six months if Russia did not come into compliance with the agreement. The Intermediate-Range Nuclear Forces (INF) Treaty signed by the Soviet Union and the United States on December 8, 1987, entered into force on June 1, 1988. The INF Treaty covered deployed and non-deployed ground-based short-range missiles (from 500 to 1,000 kilometers) and intermediate-range missiles (from 1,000 to 5,500 kilometers). By June 1991, the sides had met their obligations under the treaty, as the Soviet Union had destroyed 1,846 missiles and the United States - 846.